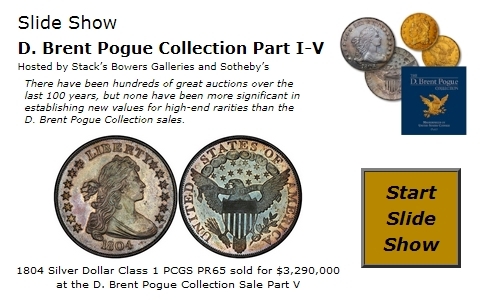 �����Dealers were pleased with the turnout at the Baltimore Coin Show this past week and sales were beyond expectations for the most part. It would be difficult to find a series prior to 1940 that is not active in this market. The next major show, the ANA National Money Show, runs March 6-8 in Phoenix, Arizona. �����Morgan Dollars are extremely hot in MS65 and higher grades. There are several dealers trying to locate the better dates for clients but these rare coins are few and far between so competition is quite intense. Deep Mirror Prooflike Morgan Dollars are also very strong and continue to bring record prices. In all cases, (including other series) low-end coins for the grade are not acceptable for new higher prices. However, there are still buyers for average coins at discounted levels. �����The metals continue to perform quite well. Silver broke through the $20 mark and Gold is chasing $1000. Even though some analysts are skeptical, there does not seem to be any slowdown. As of 9:20 am PST, Gold is $983.70 and Silver is $20.15. Platinum is up $72 at $2233.